REGISTRATION $150 per weekly session, includes supplies. Discounts apply for multiple sessions. Fill out the form below to register and submit payment through PayPal. For questions or assistance, please call the St. Augustine Art Association at (904) 824-2310. 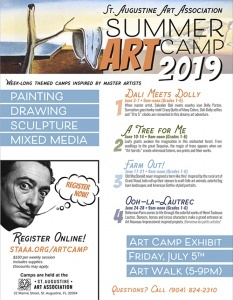 DALI MEETS DOLLY (June 3-7) When master artist Salvador Dali meets country icon Dolly Parton, Surrealism goes honky-tonk! Crazy quilts of many colors, Dali-Dolly selfies, and “9 to 5” clocks are reinvented in this dreamy art adventure. A TREE FOR ME (June 10-14) Leafy giants awaken the imagination in this enchanted forest. From seedlings to the great Sequoias, the magic of trees appears when our “Art-borists” create whimsical totems, eco prints and fiber works. FARM OUT! (June 17-22) Old MacDonald never imagined a farm like this! Inspired by the rural art of Grant Wood, kids roll up their sleeves to craft folk art animals, colorful big barn landscapes and American Gothic styled portraits. OOH-LA-LAUTREC (June 24-28) Bohemian Paris comes to life through the colorful works of Henri Toulouse Lautrec. Dancers, horses and circus characters make a grand entrance as Art Nouveau-Impressionist inspired projects. Bienvenue les petits artistes! Please select which weekly session(s) your child will be attending. Sessions run from 9am to noon and are appropriate for children in grades 1-6. Grade child will enter in the fall of 2019. Please provide at least one person who is authorized to pick up the child along with their relationship to the child, address and phone number. You may add more authorized pick ups once camp starts. Is this person is also the Emergency Contact in the event we cannot reach you? If not, please fill out the Emergency Contact info below. $150 per weekly session. Please select the total number of camp sessions your child will be attending. A $10 discount applies for more than one session. St. Augustine Art Association (STAAA) does not have a first responder or an EMT on staff and has minimal first-aid capabilities. It is the policy of STAAA to contact 911 in the event of a medical emergency. If the child has a food allergy that will affect snack choices, it is the responsibility of the parent/guardian to speak directly to the instructor prior to class. I hereby give permission for my child to participate in all STAAA Summer Camp activities. I hereby release, discharge, indemnify and hold harmless STAAA and any and all agents of STAAA from any liability, claim, cause of action, demand or damages from injury or damages of any kind to my child or property as a result of my child's participation in the educational programs of STAAA. I grant permission and understand photos of my child and my child's artwork taken during camp could be used for promotions and/or fundraising in print, advertisement and other forms of media.